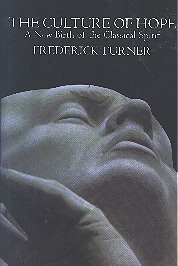 Frederick Turner is extraordinary figure in contemporary literature. The author of epic poems Genesis, The Return and The New World, Turner is also an esteemed critic and social commentator, and author of such books as The Culture of Hope, Natural Classicism and a host of essays. Turner is a fine lyric poet. 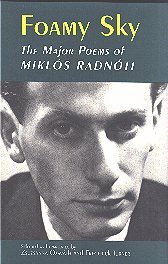 He is also a noted translator, with credits including the highly regarded Foamy Sky, the major poems of the Hungarian poet Miklos Radnoti, who died at the hands of the Germans in 1945. Not to be distributed in whole or in part for commercial purposes. So this is a good moment to put this fashion to the test--to see whether it is just a fashion, or if it promises something deeper, some transformation in the nature of poetic art that will bring our practice closer to its true function. As one of the founders and spokespersons of the movement, I nevertheless recognize that mere technique in poetic form and narrative, however skillful and admirable, is not enough; great poetry has been written in free verse, and trivial poetry has been written in tight, ingenious meters and cleverly organized narrative structures. The promise of the new trend will be realized only if poets and readers are able to take the formal elements of poetry at their deepest level, as talismans or psychic technologies designed to unlock the gates between the human and the natural, the conscious and the unconscious, the present and the past, the rational and the chaotic, life and death. Or rather, even to invoke these dualisms is to be betrayed by a language that is not truly poetic, not truly capable of the deep science in which the dualisms disappear. The pleasure of meter, as I have shown by the research reported in my essay The Neural Lyre, is based upon the three-second rhythm of the human information processing cycle or neural present, and mediated by the secretion of biologically ancient neurotransmitters. New research by Colwyn Trevarthen and Ellen Dissanayake shows that mothers and newborns conduct their prelinguistic conversations in a three-second antiphon of "motherese," and that mammals conduct their continuous little dance of movement, attention saccades, and expressive action in a three-second cycle. But meter is important at much deeper levels yet. As the psycholinguists Michael Lynch and Kim Oller have shown, within the three-second short-term memory window there is room for about ten shorter beats, corresponding to syllables, or to the shortest interval in which human action reflexes can still operate; within this 1/3 second period there are nested about ten yet shorter beats, corresponding to the minimum interval at which we can perceive the order of two different sounds; and within this tiny moment there is room for about ten tinier ones, the minimum interval at which we can identify anything at all. The brain uses the meter in which neural firings are exchanged as a carrier of precise information about what is perceived or remembered, and the enzyme and RNA factories that construct the body's proteins consult their central DNA library in an intricately hierarchical rhythmic pattern. Ilya Prigogine has shown that complex chemical reactions, especially those involving catalysts, have a rhythmic temporal structure, and quantum chemists and physicists have long known that matter can be described as the nodes where the different local periodicities of energy quanta find their harmonic resolution--matter as a kind of rhyme. . . .
Perhaps indeed this is the meaning of the myth of Orpheus, the first poet in the Greek mythology, who, like Solomon, or like Vyasa, the mythical poet of the Mahabharata, could speak the languages of animals and plants and stones. Orpheus' journey to the underworld and back (as Virgil says, any fool can go down there, but to return--this is the labor, this is the task) is more than just a search for his lost wife Eurydice. Or rather, the search for his lost wife means the recovery of the organic connection with the rest of the universe. The point is that Orpheus can make his journey only because he possesses and can use his lyre, the instrument by which Greek poets kept the measure of their meter and gave their lines a rhyme. It is the lyre that opens the gates of the underworld; and it is when Orpheus fails to trust its magic, and looks back to see if Eurydice is following, that he tragically loses her forever. We can follow the mysterious logic of the myth still further; for the lyre of Orpheus (and of his father Apollo) was originally the invention of Hermes, who traded it for the caduceus, the snake-entwined rod by which he conducts mortals between the lands of the living and the dead. It so happens that the double helix of the two snakes is an exact model of the shape of the DNA molecule; and this is not just a coincidence, for the double helix is perhaps the best intuitive diagram of any feedback process, and DNA is the feedback process of feedback processes. If the lyre, then, is in some sense equivalent to the caduceus, we may infer that the meter of poetry is analogous to the meter of biological reproduction and evolution. This is the central insight of Rilke's Sonnets to Orpheus. Other versions of this talisman are the magic flute of Mozart and da Ponte, the golden bough of Virgil, the metatron of Moses (also a combination of rod and snake), the drum of the Asiatic shamans, the bagpipe of the ancient Magyar bards--even perhaps the "Mcguffin" of Alfred Hitchcock. But this is perhaps to give too great an emphasis to meter. One could make much the same argument for narrative technique, that marvellous system by which time takes on its strange, unspacelike asymmetry. A story, like a melody, is any sequence of events that are retrodictable, that is, can be shown to have been inevitable once they have happened, but not predictable before they have happened; because the events themselves bring about a new kind of universe in which their antecedents now add up to an irreversible chain of causes. (The most crass example of this is the detective story, whose solution is obvious once the sleuth unveils it, but not before). In this sense we may perhaps take the rod of Hermes' caduceus to mean the fixed retrodictability of a story, and the snakes to mean its protean unpredictability. The unpredictability of a story is what makes us want to know what happens next--and this is why the Sultan spares the life of the storyteller Sheherezade, and Minos spares the life of Orpheus. In this light the duality of meter takes on a deeper significance still. The fixed pattern of stressed and unstressed syllables (or long and short syllables, or tone-changing and tone-unchanging ones as in Chinese verse) bears the same relation to the varying pattern of spoken cadence that floats above the fixed framework, that the predictable bears to the unpredictable elements of a story. Or one could even say that meter was micro-story, or that story was macro-meter. The new shaman must also learn the dialects of the tribe--and that tribe is now global, the human race itself. The most important dialects are the ones that are shared among all peoples, and are taken as legitimate media of exchange and criteria of agreement--trade, law, technology, and above all, science. Science is the way we learn the languages of all of the rest of nature, beyond our human circle, and thus is even more important for a new poet to know than trade and law. Technology connects science with the others--the special technologies of the poet are meter, storytelling, and imagery (which I have not dealt with here because it is so well handled elsewhere). Once we adopt the responsibilities of the shaman, many wonderful things that as poets we find increasingly difficult to achieve will suddenly become easy. One of them is finding a subject: we are engaged in the work of educating and healing our fellow-citizens, and we need only speak of what they need to know and hear. Another is being funny. The moment we recognize ourselves as the peculiar kind of primate mammalian animal that we are, trapped and incarnate in the material slapstick of physical existence, forced in the theater of human miscommunication to give and receive gifts from others in order to survive at all, laughter is hard to avoid. Shakespeare, perhaps the greatest shaman of all time, who fulfills all the difficult criteria I have tendentiously laid out here, knew all this very well. Another suddenly available resource will be vision. Instead of having to strain our humdrum daily perceptions for some little plankton-like smear of insight, we will have almost the opposite problem: how to make the miracle of existence, with its humming and ringing levels of concentric complexity, local enough to convey in an image or anecdote. Finally, the true shamans will find that rarest of all contemporary resources: a real audience, a public not drawn to the poet in hopes of recognition for its own poetic efforts, nor attracted by the fading glamor of another era's poetic achievements, nor hoping to share a fellowship of social and cultural failure; but coming together in the deeply pleasurable, ancient, ad hoc ritual of world-construction.